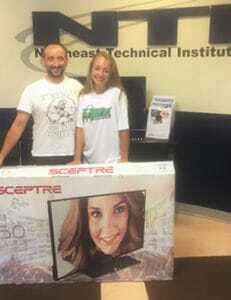 At this years Windham Summerfest, NTI raffled off a 50″ Smart TV. This year’s winner is Rick Leslie, who attended Summerfest with his daughter (Miss Maine’s Outstanding Teen). Rick graduated from USM in 2010 with a BA in marketing and is a National Trainer for a Marketing firm. Rick’s also looked into our programs and thinks they’re great and may be something his 2 daughters will pursue once they graduate high school.